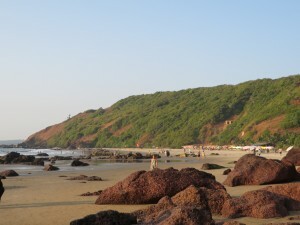 We thought we’d look around at other parts of Goa, because we had heard that Arambol Beach wasn’t necessarily the best place to be, despite its beauty. After a few days of settling in and establishing our routine, we hired a scooter for a day and set off to explore the coast of Goa, and visit Anjuna Markets. Traffic in India is generally insane by Western standards, and we had avoided driving on Indian roads until this point, but Goa, at least along the coast, is not like Pune or Mumbai – the roads are usually just one lane each way, and the vehicles are sparse enough that one is only occasionally confronted with a wall of oncoming metal as two vehicles overtake a slow one at the same time, side by side. 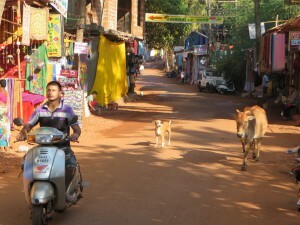 Anyway, Ravi felt confident enough to putter along country roads in Goa on a scooter, so we thought we’d choose the day that there was a big market in nearby Anjuna – about half an hour south of Arambol – so that even if we didn’t find a better place to stay, the day would not be entirely wasted. Along the way, we came across a fine example of the Indian version of facadism. It seems to primarily affect churches – they have a very impressive front, and then when you look at them from the side, you realise that the actual building is much smaller than the imposing front implies. We buzzed through a number of beach towns, but none had accommodation any cheaper than where we were, nor WiFi any better. 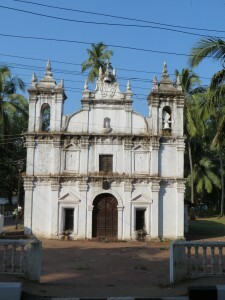 In the end, we congratulated ourselves on having found the best base for our purposes in the north of Goa, and resolved to stay where we were for the rest of our time here. 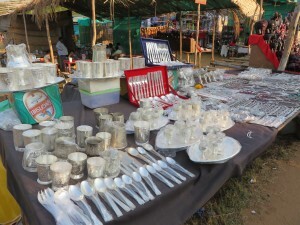 And then it was time to hit the Anjuna Markets! 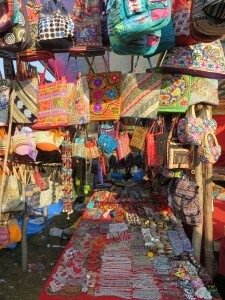 Acres and acres of stalls selling bags, shoes, spices, clothing, souvenirs, and more. 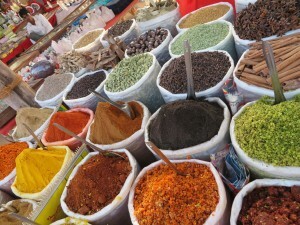 We suspected that this market had developed in this particular direction due to the high number of tourists in the area, and possibly even came into existence purely to service the tourists, because there were not many of the typical Indian market stalls – fruit and vegetables, street food, flowers and incense, and so on. And the clothes on sale were much more revealing than any respectable Indian woman would ever wear! After seeing as much of the markets as our energy allowed, we made our way back to the scooter for the sunset ride home – but not before stopping in to the clothing stall run by a couple of young women who had met us in the car park and befriended us, trying valiantly to stop us from being seduced by other clothing vendors as we headed toward the area of their stall. We ended up with a few new clothing items to replace some of our tattered and faded wardrobe, but we didn’t find the kind of things Jenny was hoping to find in India. 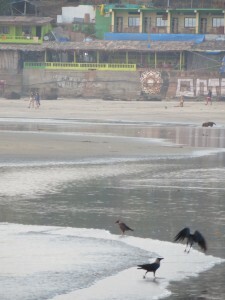 Back at Arambol Beach, we headed up the main road to talk to some of the many tailors beavering away. Jenny got some shorts made to measure (same price as off-the-rack! ), two new skirts, and a new swimming costume (the one she had brought from Australia, now ten years old at least, was literally falling apart at the seams). And we found a cafe that made really good shakshuka! One morning, we headed to this cafe for shakshuka at about 9 am (one nice thing about Arambol was that cafes actually opened up for breakfast at 7 or 8 am – in Pune, where people start work at 10 or 11 am, “breakfast” cafes were rarely open before nine). 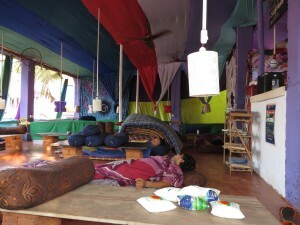 When we arrived, we found all the staff sleeping on the job! Our favourite time to go to the beach was early morning – the partying tourists were all in bed, and only the yogis were up and about, so we could swim just about alone most days. Ravi had a flu, which slowed us down a bit, and made us glad that we had decided not to move. 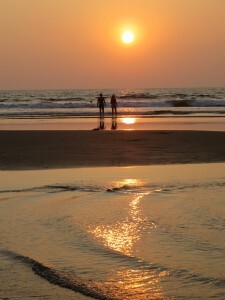 It did mean, though, that a lot of things we had intended to do were left for our last few days at Arambol Beach. Those restaurants, for example, on the point, with views straight down the length of the beach – we finally got there for breakfast just a couple of days before we left. It was a fascinating study in the contrasts that India constantly offers. This picture, for example, was taken literally side by side at exactly the same time in the early morning as the photo above, where you can just see the restaurants on the point. In the first one, you see a beautiful beach, almost untouched by human hand, with just a single person gazing out to sea. Just behind that single person, however, is all this! Piles of garbage, people, dogs, crows and seagulls … framing is everything when it comes to photos! 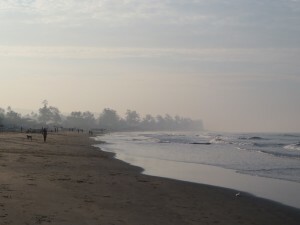 Like all of India, Arambol Beach embodied both beauty and overcrowded pollution. In the early morning, the overcrowding was less oppressive, but the pollution was unavoidable. 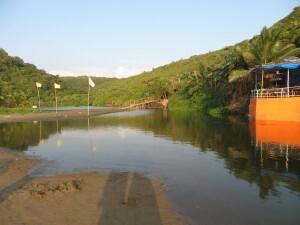 Our final mission for this trip was to visit “Sweetwater Lake”, a freshwater lake right by the beach just north of Arambol’s main beach. 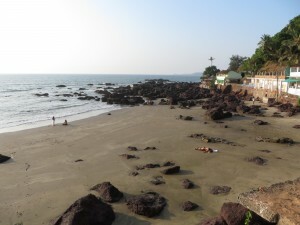 It can only be reached by walking north from Arambol Beach, along a narrow path that winds around the cliffs. We left it until late afternoon before we set off, because walking is very burdensome in the heat of the day. 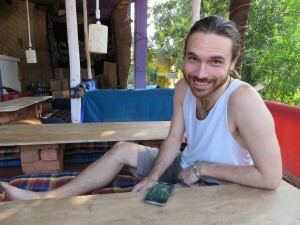 You won’t see this in other parts of India, but Arambol was a place (like Koh Phangan in Thailand, and like Byron Bay in Australia) where Westerners who are into yoga, meditation, drum circles, and love festivals have been gathering for many years. 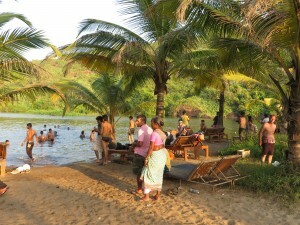 The small number of local Arambol residents seem to have accepted the weird ways of these tourists. 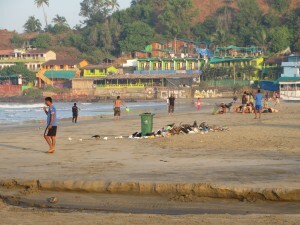 Goa is already known as the party place of India – the place that young Indian men go to drink, dance and try to get laid – so perhaps the norms there are a little more relaxed than in other parts of India. You couldn’t wear either of t hese outfits on the streets of Pune, for example, without attracting a LOT of disapproving attention. 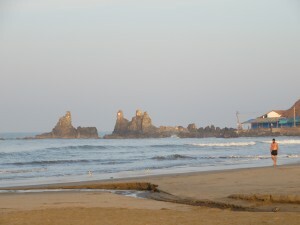 Sweetwater Beach is a little rocky, and had much larger waves than Arambol Beach, probably because Arambol Beach has a large sandbank about 50m offshore, that is completely dry at low tide. Right beside the sand and salt water is the freshwater lake. It is quite large, and relatively shallow. One section is apparently the designated swimming area – enterprising locals have installed European-style beach chairs (rentable by the hour or the day), while others walk around offering fruit and sarongs for sale. It seems to be a favoured place for Indian residents to swim – by contrast, we hardly ever saw an Indian national in the ocean. Ravi took a dip in the lake, but Jenny held out for the actual ocean. For people who don’t like swimming in salt water, Sweetwater Lake is a wonderful place. Again, as in other places, crowding is an issue, at least if you want to swim at the best location. The bottom of the lake here is sandy, but in other parts there are layers of rotting leaves underfoot, which can be unpleasant for some. We really didn’t want to leave Arambol, but we still had a few things to buy, particularly cotton T-shirt material blouses for Jenny to wear under her sari, and we though the capital of Goa, Panjim, might offer us a better chance to find such things (and buy them at more reasonable, local prices, too). 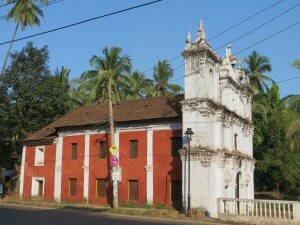 Given that Ravi was still not quite 100%, we passed on the multi-bus return journey, and instead hired a car to give us door-to-door transport from Arambol to Panjim – a brief moment of feeling more like celebrities than backpackers! ← Gen X and Not Liking Hillary Clinton – Are We Really Just Sexist?